Yesterday a friend showed me a new route which finishes right outside South Entrance on University Boulevard. It was via Attenborough Nature Reserve and Beeston Marina, much more scenic than the road route and a couple of miles extra (which is good as it was Cake Thursday at work). It made a nice change to cycling along 6 miles of road, really enjoyable. 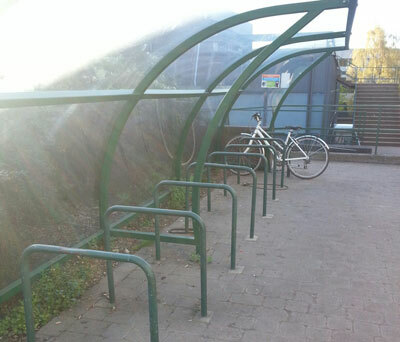 I arrived at work at 7am, the first one there. I got my pick of spaces today. My journey home wasn’t as enjoyable. Chris cycled to meet me from work at 5pm (that was the good bit). We instantly hit traffic. I’d been told that cycling home in rush hour ensures you get home quickly and you can pretty much predict how long it will take. I would mainly like to thank an inconsiderate human being driving a dark blue transit van. I’m no expert when it comes to cycling on the road but one thing I do know is that where there’s a cycle lane, dark blue transit vans should not drive into them causing potential danger to a cyclist. He was definitely doing it on purpose as every time we caught up with one another he would move in front of me in the cycle lane again. And so out came my two fingered salute! After which, I was praying that we wouldn’t catch up with each other again. You can’t beat a bit of light road rage, right? Today, Kelly and I cycled to and from work via Attenborough Nature Reserve. This made for a relatively stress free day, apart from the bit just before we were leaving work where I couldn’t find the key to my bike lock. 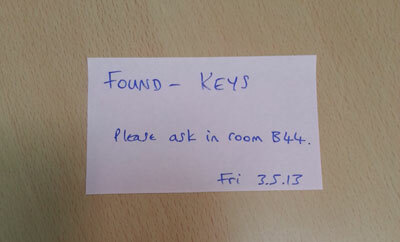 A note stating that my keys had been found. Luckily some lovely person found them in the showers and handed them in to a nearby office. I’m going to stick my neck out hugely here and guess that this wasn’t the transit van driver. Home and straight back out on the bike for a Friday evening pub crawl with Kelly and Chris. This resulted in my first ride in the dark and my first time riding after having a couple of ciders. Don’t drink and ride people!